FACE is fortunate to partner with many talented and compassionate veterinary professionals throughout San Diego. Andrea Baldwin, Client Services Representative at the San Diego Pet Hospital in Lemon Grove, exemplifies the passion for animals and dedication to client service shared by our veterinary partners. 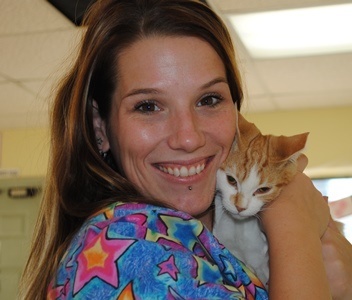 Andrea has worked at the San Diego Pet Hospital for over two and a half years. “I love all animals, big and small,” she says, “But the ones with four legs I think are my favorite!” She currently shares her home with three cats and two rats. This love for animals comes through in all aspects of her job at the hospital. She describes working at a busy veterinary practice as “an everyday learning experience.” Andrea enjoys helping pet owners with the health care of their companion animals. Her compassion for animals extends beyond the veterinary office. With her daughter, she visits the Humane Society to make donations, and they also help socialize the shelter pets waiting for their forever homes. Andrea values San Diego Pet Hospital’s relationship with FACE. “The joy and relief it brings to an owner to have assistance to help their beloved furry family members is priceless,” she says. Andrea has fond memories of many FACE cases. She points to one recent example, a Cocker Spaniel named Tucker, as particularly special. Tucker’s mom was sent to San Francisco for work and struggled with housing and travel expenses. While she was away, Tucker injured himself and needed FHO (femoral head osteotomy) surgery to alleviate pain. Tucker’s owner was so concerned about his suffering that she even considered euthanasia as a last resort. Fortunately, the hospital contacted FACE and we were able to contribute to Tucker’s surgical expenses. “Everyone at FACE is professional, sincere, and very helpful,” Andrea says. “I have found that every case or animal I contact them for, I get a prompt response and all that can be done, is.” Andrea’s dedication to the care of both her animal patients and human clients is inspiring. FACE thanks Andrea Baldwin and the rest of the compassionate veterinarians and staff at San Diego Pet Hospital for all that they do to help the pets in their care!